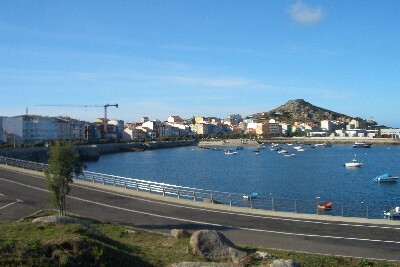 Muxia is a coastal district in la Coruna province on the "costa da morte" (coast of death) above Fisterra. Contrary to popular belief it is actually Muxia (Cabo Tourinan) and not Finisterre that is the most westerly point of mainland Europe. Muxia has a lot to endear it. It really is a beautiful little town and has some stunning beaches in the form of the playas of Muinos, Cruz, Lago, Lourido and Nemina. It has a great little manmade harbour that is walled on two and a half of its sides. There is also a great promenade that runs the full length of the town plotting a course that is parallel with the main coast facing street of Rua Virxe de Barca. Muxia's beach side town is definitely touristy, but in a nice and unspoilt way and it has some small to medium sized hotels along with a couple of restaurants and some bars. During our visit in October 2007 (when we enjoyed non stop warm and sunny days) the town was quiet, but it has a tourist office plus a small tourist cabin (hut) which opens in the summer months. The main and most famous tourist attraction of Muxia is an oddly shaped stone that sits on an outcrop of rock sandwiched between an old church and the ocean. 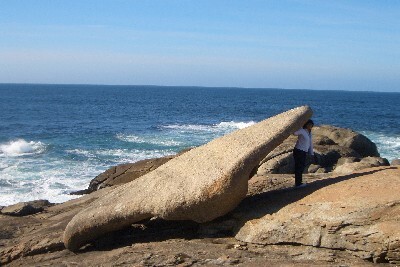 The shape and position of this long, narrow and slightly curved stone is such that a human being can easily stand beneath it, and this has led to one of Galicia's many folk stories evolving around it. It is claimed that the stone has everything from healing powers (relieving kidney pain) to assisting in the conception of children, and all achieved simply by standing or crouching beneath it. True or otherwise the stone is now quite famous and its position, in front of the crashing waves of the sea, make it quite a spectacle. There is a festival that includes references to the stone and its powers which takes place annually on the mountain above the adjacent church. The church above the mythical stone is another visual treat, both inside and out, and there is a strange abstract stone monument on the hill above it. The area also has a number of walking routes, all offering breathtaking views of the ragged shoreline of Muxia. Other things to see in the town of Muxia include a number of churches (additional to the one by the stone described above). In total there are approximately seven interesting churches in the district and most date back to the twelfth or thirteenth centuries. A walk along the ocean facing promenade is enjoyable in itself and it gives any visitor excellent views of the spectacular winding bays of Muxia. 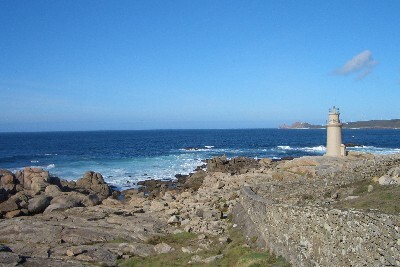 It also offers clear sights of two lighthouses, one in the town and the other at a more distant location across the bay. Additionally, there are views of some odd looking wooden framed structures just behind the coastline and these are used to hang and dry fish – a traditional method of preserving seafood in the costa da morte area. Muxia is a really great example of what makes up a perfect Galician seaside town. It has a nice little centre, some old buildings and interesting churches, plus a magical stone, stunning scenery, coastal walking routes and a location that is close to many other similar towns as well as la Coruna city. The only downside is that (as is so often the case in Galicia) there is no foreign language information available on the town and on this occasion, no one in the tourist office spoke English, French or German. 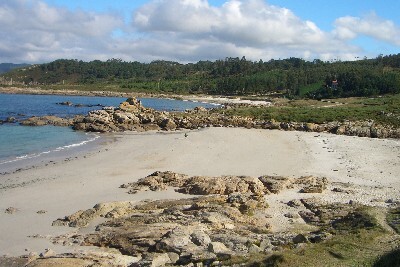 Muxia is pronounced much-ee-a in Galicia.